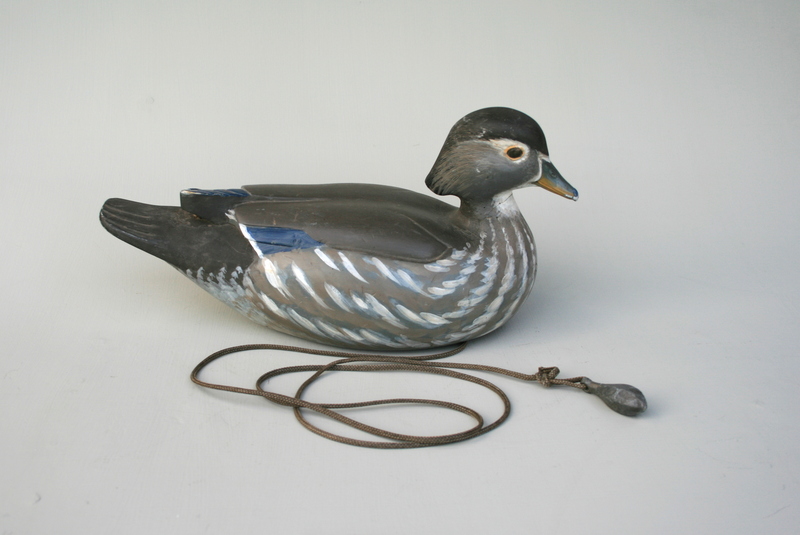 I remember seeing my first Wood Duck. I grew up on Long Island’s south shore and rarely saw the bird – mostly because the water we used was Great South Bay. The tides and the salt tend to keep Woodies away from the marshes there. But, as I later learned as a duck biologist for New York DEC, Long Island has its share of this species, especially along the headwaters of its larger rivers and creeks. I saw my first one at the Bayard Cutting Arboretum – a State Park that had once been the estate of a Wall Street financier in the early 1900s. The Arboretum lands front along the brackish section of the Connetquot River and there is a chain of shallow impoundments that feeds into the River from the Park. It was in one of these ponds that I saw my first Drake. I was probably 11 or 12 and had held most other Atlantic Flyway species in my hands by then – thanks to my Dad’s prowess with his Winchester Model 50. 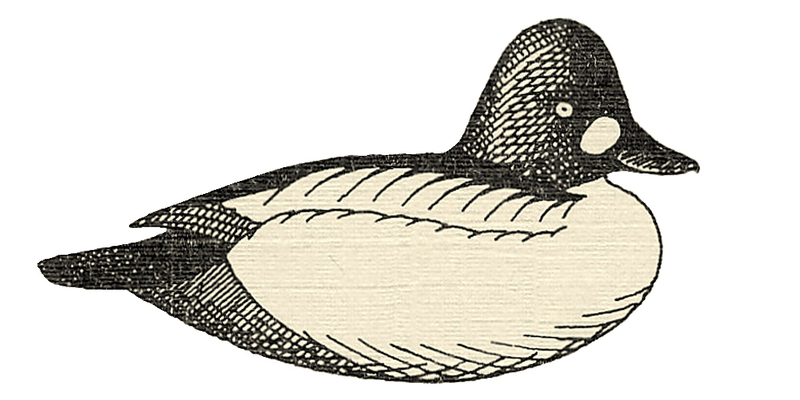 And although I knew about Wood Ducks and had studied their images in all of our books, I was unprepared for the visual impact. The vivid colors and bold markings were surely enhanced by the shadowy stillness and sharp reflections of the protected pool on which he paddled slowly. I had never encountered anything like it. 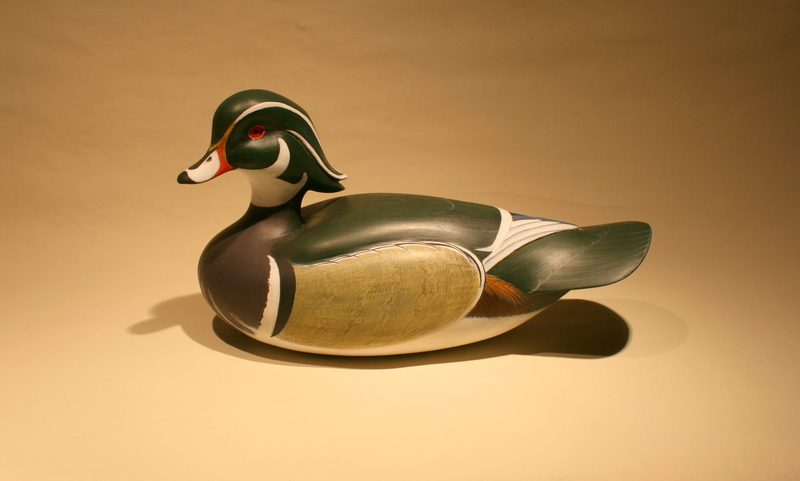 The mantelpiece Wood Duck above was carved for the annual fundraiser run by the Agricultural Stewardship Association – a not-for-profit dedicated to preserving the farm landscape hereabouts. It is a cause close to my heart and I am happy to be able to contribute toward their purpose. 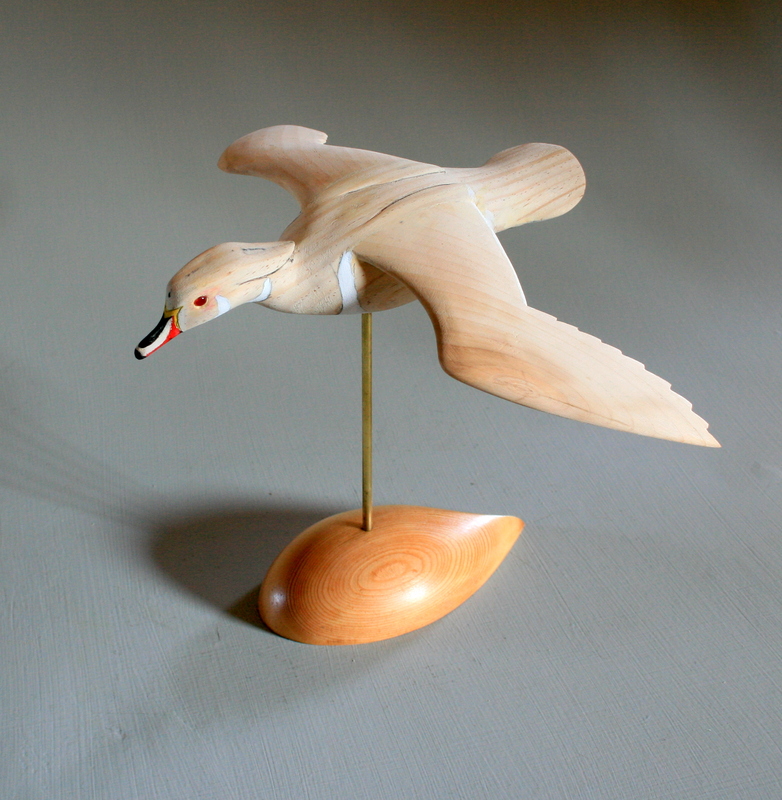 This bird – carved for ASA’s 2012 exhibit – is hollow White Pine finished with oils. 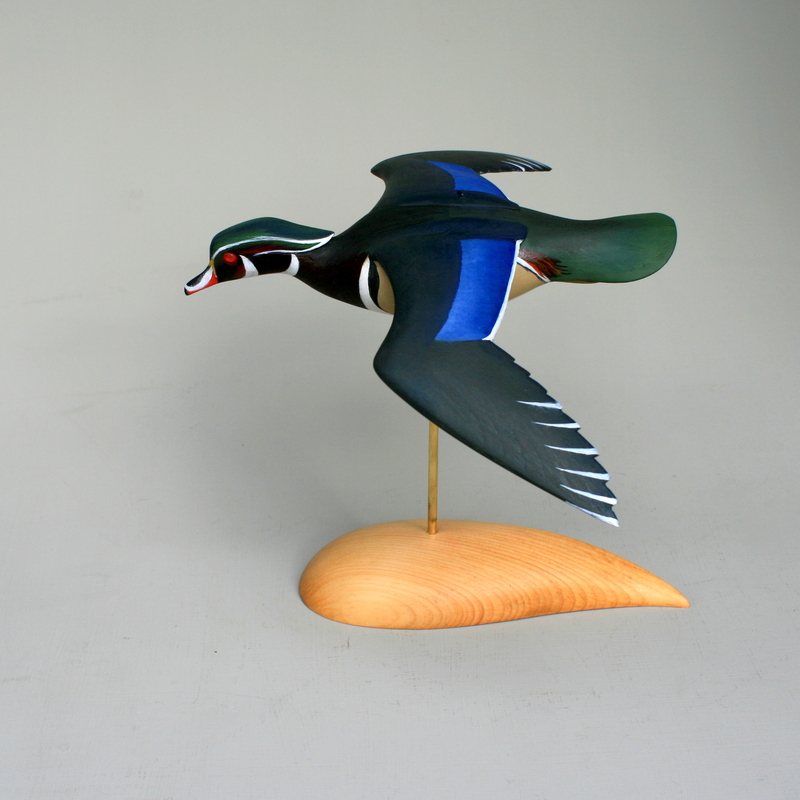 This Flyer tries to depict the darting, dropping – and very fast – flight of an incoming Woodie. This is maybe the sixth flyer I have carved. The wings are mortised into the body – their curvature is limited by the grain of the wood, but I think the moments in flight when a bird is changing – noticing, deciding, committing – are the most interesting. If I am successful, the tension can be seen – and almost felt – by the observer. My Flyers can be displayed on its stand or suspended from above. They typically look best when they are at or just below eye height. 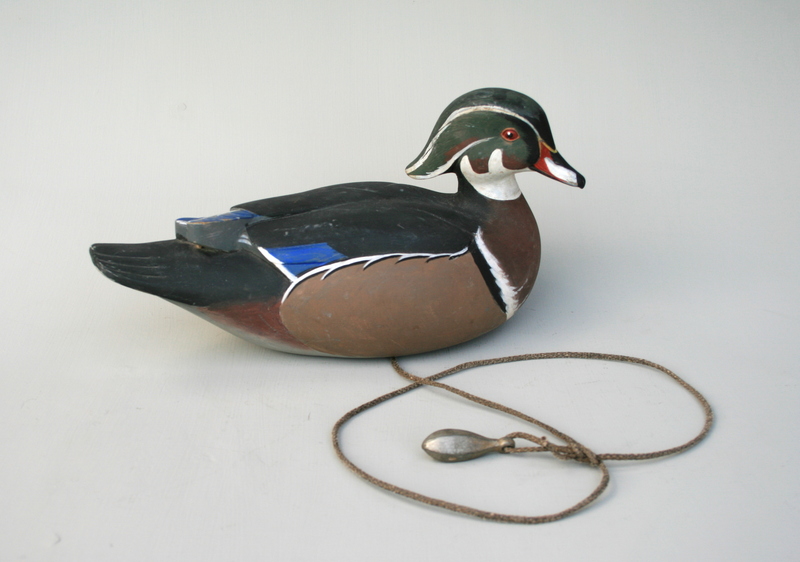 Of course, the Wood Duck provides one of the happier stories among waterfowl over my lifetime. Their numbers have steadily increased – along with their bag limit – and they are now a key part of life in dairy country. These two gunners are E Allens – from Lock, Stock & Barrell. 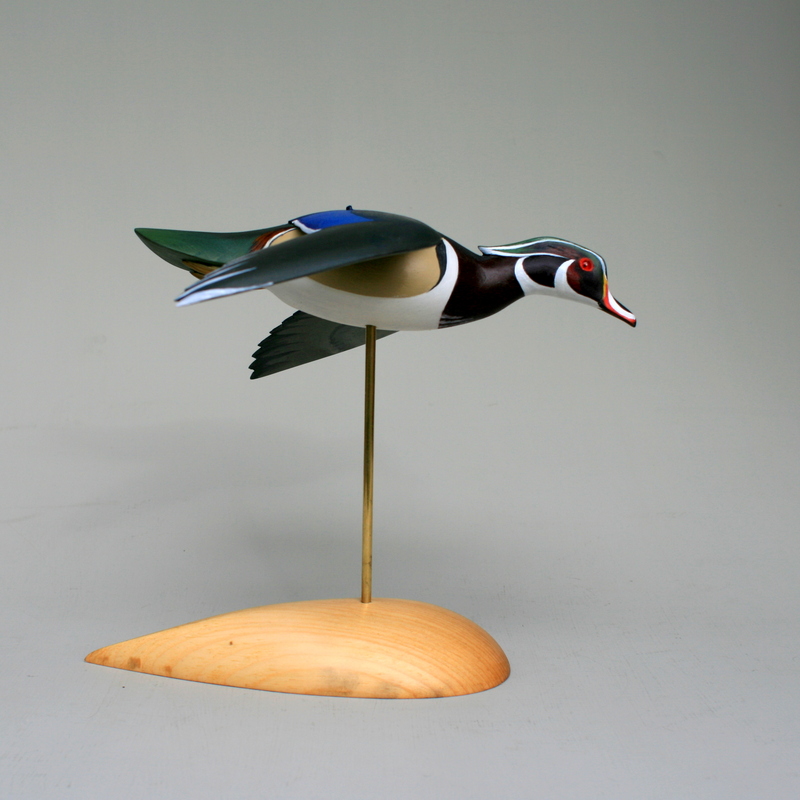 A friend gave 3 of them to me – to add to my freshwater Allen Mallards and Blacks – when I painted his Allen Greenwings and Woodies for him. As with the others in my rig, both weight and space are at a premium so I installed flush, unballasted keels and use just 1-ounce sinkers as anchors on the tarred nylon.